Over the course of three seasons, players lead their clans to conquer feudal Japan. Each season ends with battles taking place in different pre-determined provinces. However, that doesn’t mean that peaceful negotiation is not possible. Each season opens with the Tea Ceremony phase of the game. This gives players a chance to form an alliance that may last for the entire season. Deals can be made between any two players, but there is a lot to consider before joining forces. “You have to make a conscious choice, whether you want to go by yourself or you want to choose a player to share bonuses with,” said Rising Sun designer, Eric M. Lang. 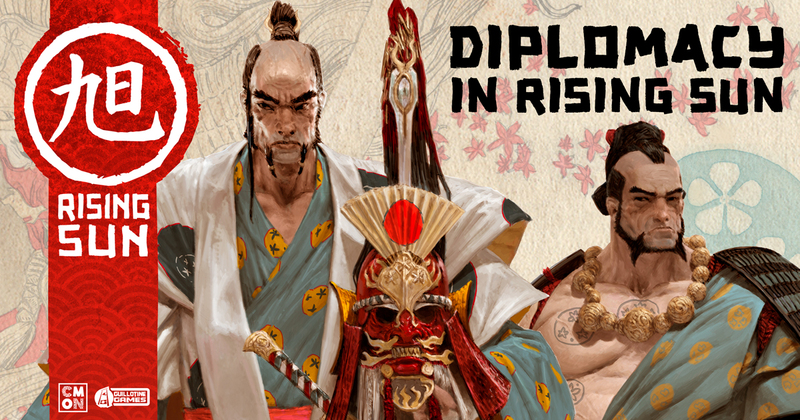 Diplomacy and partnerships can manifest in many different ways in Rising Sun. During the game, players take turns selecting political mandates that allow everyone to take actions. However, the active player and their allies get a bonus associated with the action as well. For example, if a player chooses to Marshal, everyone gets to add a non-Daimyo figure to the board and make a troop movement, but the active player and their allies have the option to recruit their Daimyo. Even if players aren’t allies, they can still make deals and barter to try and come up with a scenario that benefits them both. The order the political mandates come out can be important, so players may want to influence the decisions of others. Bribery is allowed, and even encouraged. That sort of open negotiation can sometimes favor players that are a little better at talking a good game. However, Lang was careful over the course of his design to not let the social aspect become too important. Working in the element of alliances and diplomacy to Rising Sun was an interesting challenge for Lang. He designed the political dynamics between the players to work their way into every decision. It ends up being a tense balancing act between cooperation and aggression. “I wanted the reason for these forced partnerships to become emergent after a few rounds,” said Lang, noting that the more players are exposed to those partnership possibilities, the more working together to achieve certain goals makes sense. Trust is an important element when you decide to team up with someone, and whenever there is trust, there is the potential for betrayal. One of the political mandates only benefits the active player. They gain a great deal, but they’ll lose honor in the process and break any alliances they had. In Rising Sun, players are not bound to any verbal agreements they make, but they’ll have to weigh short-term benefits against the loss of trust in the long term. Diplomacy is perhaps the most important when it comes to war. For each conflict that takes place, players secretly bid money on four different battle actions. Only one person will win each bid, so anticipating, or even talking about what each player hopes to do, is a good strategy. “It behooves players to discuss what they want out of war before committing their bids,” said Lang. “Those who coordinate well, will get favorable outcomes for less money.” That is, of course, assuming you can trust the person you just made a deal with. Lang has succeeded in creating an entirely new game experience in Rising Sun that is both innovative and intuitive. It’s not long before players will start to see the true potential of negotiation. “When you play even one season of the game, you start to see the positions and why you’d want to ally with one player over another,” said Lang. It’s entirely possible to play a game of Rising Sun never joining forces with another player. But the addition of that strategic possibility is extraordinarily enticing. It completely supports Lang’s desire for Rising Sun to be a polite and civilized war game. We may kill each other on the battlefield, but there’s no need for us to be brutes about it. Rising Sun is coming to Kickstarter on March 7th at 3 PM EST. Read our Rising Sun Overview article here.